Company bringing its A game? Details of Samsung's Galaxy A range have been coming thick and fast in recent weeks, but the latest internet leak gives us an idea of the company's pricing for one of the new phones. 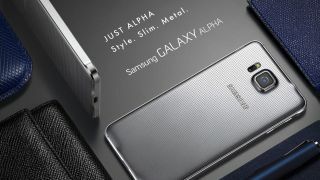 The A range will follow the design principles of the Samsung Galaxy Alpha and consist of three handsets: the Samsung Galaxy A3, A5 and A7. Previous rumours suggested the Galaxy A5 handset would go on sale for around $400 (about £250/AU$450), but a new leak hints it will be higher than that. The leak in question is a catalog listing from a Kazakhstan-based retailler putting the price at 99,990 Kazakhi tenge - roughly $550 (about £342/AU$620). The listing also gave pretty definitive specifications and dimensions for the new phone, stating it will be a 5-inch device with a Super AMOLED HD display. Also on board is a 1.2GHz dual-core processor, 13MP camera and microSD expansion port. This corresponds to previous specification leaks that also reveal the phone will boast 16GB of native storage and a 2,330mAh battery. The size of the handset is given as 139 x 70 x 7mm and the weight is just 123g. Samsung's Galaxy A range is apparently the Korean manufacter's attempt to diversify into the premium materials favoured by the likes of the HTC One M8 and Apple iPhone 6. Each of Samsung's new phones will have the same aluminium unibody construction as the Galaxy Alpha as well as 64-bit CPUs, Android Lollipop and other features like Samsung's fingerprint scanner. Samsung, predictably, hasn't commented officially on any of these leaks, but given the extent of information that's now reaching us it probably won't be long until the company hosts an official reveal. Read our Samsung Galaxy S5 review.